From the time a buy-sell agreement is executed until the time a transaction is closed, dealership buyers must be on guard against seller acts that can financially harm dealerships shortly after closing. The seller should be held accountable for any acts it takes prior to closing that erodes this goodwill. To address such acts, buyers and their counsel should include several provisions into their agreements to hold selling dealers accountable for these acts. Every buyer wants to take over a dealership and feel on Day One that the seller and its managers and employees have continued to make best efforts to sell and service vehicles during the weeks or months prior to closing. The buyer has paid for the value of the prior owner’s sales, marketing and customer retention efforts through payment for “goodwill” – i.e., the intangible value of the dealership above and beyond its hard assets. Consider the crucial issue of the relationship with the franchise’s manufacturer. While a buyer can get assurances from the seller during due diligence of how strong the seller’s relationship is with the dealership’s manufacturer, it is important to hold the seller accountable in the buy-sell agreement for any statements made regarding that relationship. For instance, a buyer should get representations from the seller that it has not received any unabated written notice of any facility or other franchise deficiency from the manufacturer. The seller should also represent that it has not received notice requiring it to relocate the dealership operation or to improve or modify the dealership’s premises. A buyer does not want to be told by the seller that the manufacturer has no issues with the dealership, then later have the manufacturer impose unanticipated requests to “improve” the facility or dealership operations based upon issues that arose prior to the buyer taking over the franchise. There are important inventory items to consider, as well. A buyer needs safeguards in place in the buy-sell agreement when the seller has other same line-make dealerships and may want to move more popular new vehicles to those other dealerships. Safeguards would include a warranty that the seller shall not sell or transfer any vehicle outright to these other dealerships. A buyer does not want a seller wholesaling its fast-moving inventory to a sister store of the seller’s when the buyer’s dealership could sell such inventory after the Buy-Sell is complete. When dealers have other same line-make dealerships, buyer counsel should also anticipate that the seller may want to swap vehicles between the dealership being purchased and these other dealerships. Swapping of like models and similarly equipped vehicles may be reasonable. However, such swapping should be determined in advance of closing and with the mutual agreement of both the buyer and seller. Another consideration for a prospective buyer would be to protect against a seller taking deposits for hard-to-get models for friends and relatives, and the buyer having to deliver these vehicles to the seller’s friends and relatives at cost. This may help the seller but does nothing to help the buyer’s profitability on its new vehicle sales. To address this concern, a seller should warrant to sell at the customary profit levels for the preceding six months. Sellers should also warrant to not remove equipment or accesso­ries from vehicles to be purchased and represent that such vehicles are equipped as per the manufac­turer’s invoice. Each of these warranties is important – without the selection of models or features they want, customers cannot drive off the dealership’s lot with a purchased car and will probably go to another dealership, costing the buyer in lost sales revenue. Furthermore, a buyer should not be obligated to purchase any unsold vehicle that has been reported as sold to the manufacturer, unless the seller can reverse any such reported sales prior to the closing. In an effort to achieve minimum sales responsibility targets imposed by the manufacturer, a seller may be tempted to falsely report unsold vehicles as sold to the manufacturer. This can be a concern for the buyer, however, because the report to the manufacturer starts the warranty period running on these unsold vehicles, which will then have to be sold at reduced value to compensate for the loss of warranty coverage period once these vehicles are actually sold to customers. A buyer should also consider asking a selling dealer for several warranties to enable a seamless transition on dealership operations. In particular, a seller should warrant to keep the dealership “open and operative in a regular and ordinary manner consistent with past practice and for not less than the hours customary for the business.” For instance, if the dealership has traditionally kept evening and weekend service and sales hours, that schedule should not have changed. From a service standpoint, buyers need to protect themselves against undisclosed service obligations a seller has made to customers. While the buyer may not have a legal obligation to these customers, the buyer may feel compelled to honor seller obligations to keep customers satisfied. These obligations can include “We Owes,” free oil changes or other services and any coupons, refunds, rebates or credits of any kind for the seller’s past or current sales and service customers. With the exception of any such offers disclosed to the buyer, a seller should warrant in the buy-sell agreement that it has not issued service warranties, other than those related to lemon laws and third-party or factory-sponsored warranties. 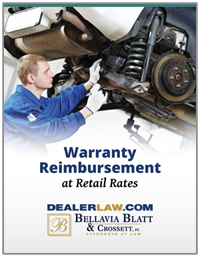 The seller should also represent that it does not, nor ever has, participated in any in-house warranty or maintenance program and state that such warranties and programs are expressly excluded from the buy-sell agreement. The provisions highlighted above are not typical or boilerplate provisions in a buy sell. However, a buyer’s counsel should take care in foreseeing the problems that these provisions address. I have seen them occur frequently, and the buyer will want to know that he or she has been protected against them in the buy-sell agreement.